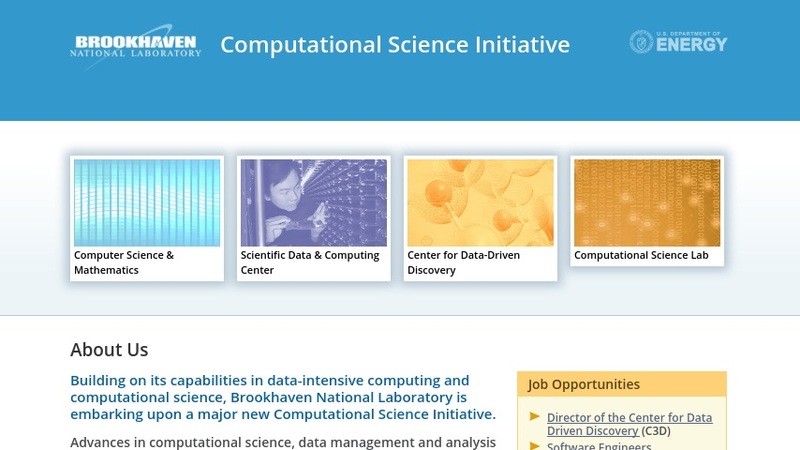 The Brookhaven Computational Science Center is a collaborative project among researchers in biology, chemistry, physics, and medicine working with applied mathematicians and computer scientists "to exploit the remarkable opportunities for scientific discovery which have been enabled by modern computers." The Center is filling a need for upgrading the computing infrastructure within the Brookhaven National Laboratory and making "the most advanced systems available to researchers throughout the scientific community." The group's work addresses research in computational biology and nanoscience, as well as other areas of science, including nuclear and high energy physics, astrophysics, materials and chemical science, sustainable energy, environment, and homeland security. Detailed descriptions of each project and some related publications and presentations are posted on this website. Note that the link to the Workshops section of the website was not working at the time of this report.